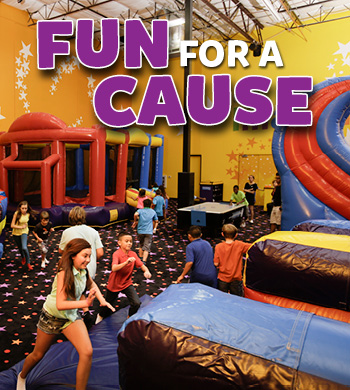 Have a jump-tastic time raising money for your school, church or other cause. Fun for all ages! We'll help you choose a weekday Open Jump time during after school or out-of-school hours. (We follow the MCPS calendar). With the minimum number of guests, you earn 30% of net admission proceeds. Want to earn 50%? We're happy to tell you how! Call us and let us help you get your event started. It's so easy and you can rest assured your guests will have a blast! Ready to Set Up Your Group's Fundraiser? 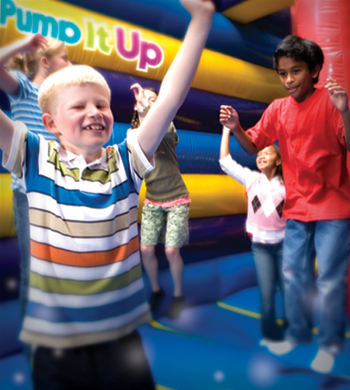 Bring your group for a 100% private event at Pump It Up! It's easy, hassle-free and most of all FUN for all ages. Our Field Trip packages are designed to meet your budget needs. We offer a discounted per child fee based on the length of time of your event and the number of children that attend. No cost for chaperones to play. We can accommodate groups that want to play and use the party room, play and have pizza, or groups that want to just have a bouncy good time! Non-stop active fun includes jumping, sliding, and climbing on our giant inflatables and engaging with our interactive games and staff. Our brightly decorated party rooms are perfect for celebrating a milestone/accomplishment, enjoying refreshments, conducting award ceremonies or just bonding as a group.